I’ve had this recipe on my wish list for awhile and never got around to making it. The other night I finally made it and now I can’t stop! 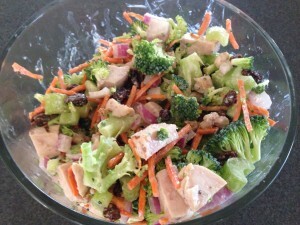 It is SO good, so easy and different than most salads I’ve made recently. Plus it’s super healthy, can’t argue with that right? In a large bowl combine chicken, broccoli, celery, onion, raisins and walnuts. In a separate small bowl whisk together yogurt, lemon juice, and agave nectar. Toss dressing with broccoli mixture until well coated and chill for 30 minutes.